This genus is accepted, and its native range is Macaronesia, Medit., Europe to Mongolia. Members of the widespread Eurasian genus Orchis occur in a variety of habitats including grassland, shrubland, and deciduous or coniferous woodland, and usually grow in well-drained calcareous soils such as those derived from chalk and limestone (Sundermann 1962, cited in Rasmussen 1995; Pettersson 1976; Dafni 1987; Davies et al 1988; Lang 1989; Delforge 1995). Among prime examples of calcicoles in the group are the Mediterranean orchids, O. italica and O. quadripunctata, which grow on dry, stony calcareous soils in maquis and garrigue shrublands and open pinewoods in southern Europe (Davies et al 1988; Delforge 1995). Similarly, many Orchis species growing in Britain are calcicolous, only occurring on chalk and limestone substrates. For example, all records of the now rare species, O. simia, have been from chalk in England, whereas O. anthropophora is found in both chalk downland in Kent and Surrey and in grassland on oolitic or Liassic limestone in Northamptonshire, Lincolnshire, and Somerset (Summerhayes 1951). Likewise, the soils from the four remaining sites of O. militaris is in southern England are all chalk rendzinas with high calcium carbonate levels, a pH > 7 .5 , and free drainage (Farrell 1985). Soils are similar from sites with O. purpurea, another rare British species confined to scrub and beechwoods on chalk in the south-east of England (Rose 1948). These soils typically dry rapidly due to their porosity, show rapid decay of the humus layer (within about one year) and are alkaline throughout their profile from the soil surface to orchid-rooting depth (Rose 1948). In continental Europe, some Orchis species can occupy a wider range of habitats and soil types than in England. Orchis militaris, for example, grows on calcareous to neutral soils throughout its distribution, but in mainland Europe it also appears on wetter soils such as marls, peats, and dune sand (Summerhayes 1951), and in central parts of its range (in Sweden, Lithuania, Poland, Germany, Austria, Hungary, and the Crimea) it is often reported from wet meadows (Farrell 1985). Orchis species also grow at higher elevations on the Continent than in Britain where they are typically lowland plants. Orchis militaris, which grows at 15 m in Suffolk and 183 m in the Chiltern Hills, is found from sea level in the Netherlands to 1800 m in the French Department of Isere (Farrell 1985), whereas O. mascula is reported at up to 3000 m in the Alps (Davies et al. 1988; Delforge 1995). Chalk and limestone soils are comparatively warm and dry, and it has been suggested that the restriction of many Orchis species to these soils in England is due to their ameliorating effect for orchid growth in the cool and damp climate of the British Isles (Summerhayes 1951). Habitats in England, at the north-western limits of the range of the genus, may still be sub-optimal for Orchis (1-lutchings 1989). The preference of many Orchis species for calcareous soils in the Mediterranean has alternatively been explained as a consequence of the low-competitive ability of these species such that they are only able to exploit successfully habitats in which there is little competition from other plants (Dafni 1987). The typical calcareous maquis and garrigue shrublands in which many Orchis species grow in the Mediterranean region are nutrient-poor because of the high pH levels of the soil and are consequently characterized by the relative scarcity of annuals and geophytes. Dafni (1987) suggested that, because of their mycorrhizal associations and characteristic adaptations for growth in disturbed areas (cf. Sanford 1974), Orchis species and other terrestrial orchids of the Mediterranean region are able to thrive in such nutrient-poor and disturbed environments where other plants cannot. One exception in the genus is the widespread species, O. militaris, which is absent from much of the Mediterranean because of its intolerance for hot, dry summers and largely confined to mountain localities in the region (Farrell 1985). Some Orchis species frequently grow on non-calcareous soils in addition to alkaline ones. For example, O. anatolica growing in eastern Mediterranean regions sometimes occurs on more neutral substrates, whereas O. siliaca (Renz) P. Delforge, a species endemic to Crete, can occur on slightly acid soils (Delforge 1995). Of the more widespread Eurasian species, O. mascula is notable because of the diversity of habitats and variety of soil types in which it typically grows. Although it prefers alkaline substrates to acid or wet ones, it does grow in neutral to slightly acid situations in habitats ranging from chalk grassland to deciduous woodland and from coastal sand-dunes to mountain cliffs. For example, in southern England O. mascula occurs in large numbers on the grassy slopes of the chalk downs but is also a frequent inhabitant of coppiced woods of oak, ash, and beech (Summerhayes 1951; Sanford 1991). Similarly, Nilsson (1983a) noted that O. mascula commonly occurs on the Swedish island of Oland in both open dry meadows in the limestone alvar and in shaded hazel groves. The widespread appearance of O. mascula in limestone pavements on coastal sand-dunes and cliff tops and on rocky mountain ledges indicates that it is also able to grow in soils that are relatively shallow (Summerhayes 1951; Lang 1989; Allan et al 1993) and at a range of elevations from sea level up to 2650 m in alpine pastures (Delforge 1995). Orchis species grow in open to semi-shaded conditions as members of a variety of plant communities, but individual Orchis species vary in their tolerance to shade. Orchis anthropophora, for example, grows best in open habitats on grassland. ln Britain it often co-occurs with tall grass species (Summerhayes 1951), Polygala species (Polygalaceae), and orchids including Gymnadenia conopsea and Anacamptis pyrimidalis (Lang 1989) as a component of various calcicolous grasslands classed as CG3 and CG5 in the National Vegetation Classification (Rodwell 1993). 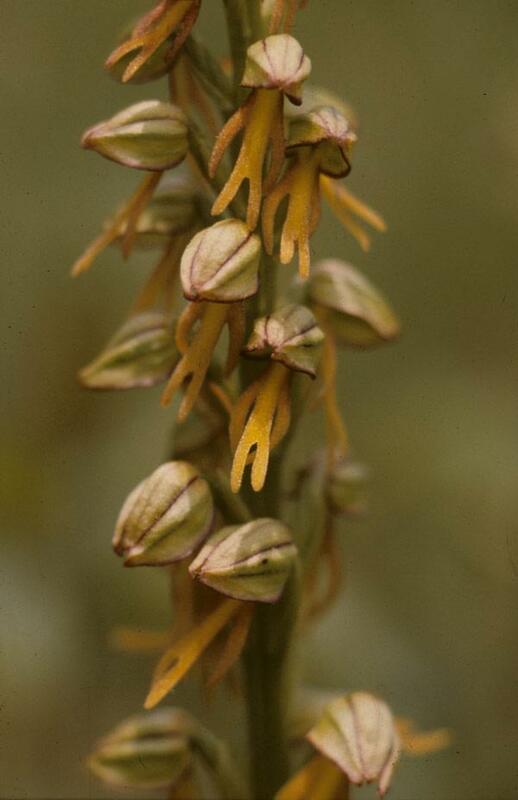 However, Orchis anthropophora may also sometimes be found growing in the shelter of isolated bushes, among open shrubby vegetation (Summerhayes 1951), and in Mediterranean garrigue, olive groves, and woodland maquis (Davies et al 1988; Delforge 1995). Similarly, O. simia tends to grow at its northern European sites in rough grassland habitat where it receives partial shade and shelter from the wind by nearby shrubs and trees (Summerhayes 1951; Willems and Bik 1991). 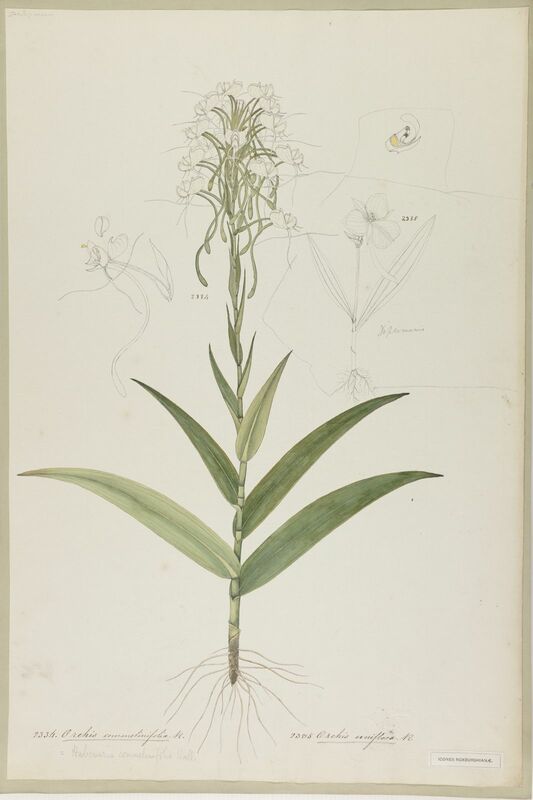 Lang (1989) lists Gymnadenia conopsea, Himantoglossum hircinum, Orchis anthropophora, and Anacamptis pyramidalis as commonly co-occurring orchids. Orchis militaris grows in full sunlight in chalk grassland but also often in moderate shade in woodland gaps or at their margins (Summerhayes 1951; Parrell 1985; Waite and Farrell 1998). Long-term observations of O. militaris populations in Buckinghamshire and Suffolk indicated that this orchid declines rapidly if habitats become too heavily shaded (Hutchings et al. 1998). Farrell (1985) listed the principal co-occurring plants at several O. militaris sites in Britain and continental Europe, which include grass species in genera such as Brachypodium, Briza, Bromus, Festuca, and Agrostis. Other members of the genus occur more frequently in semi-shaded conditions in woodland. 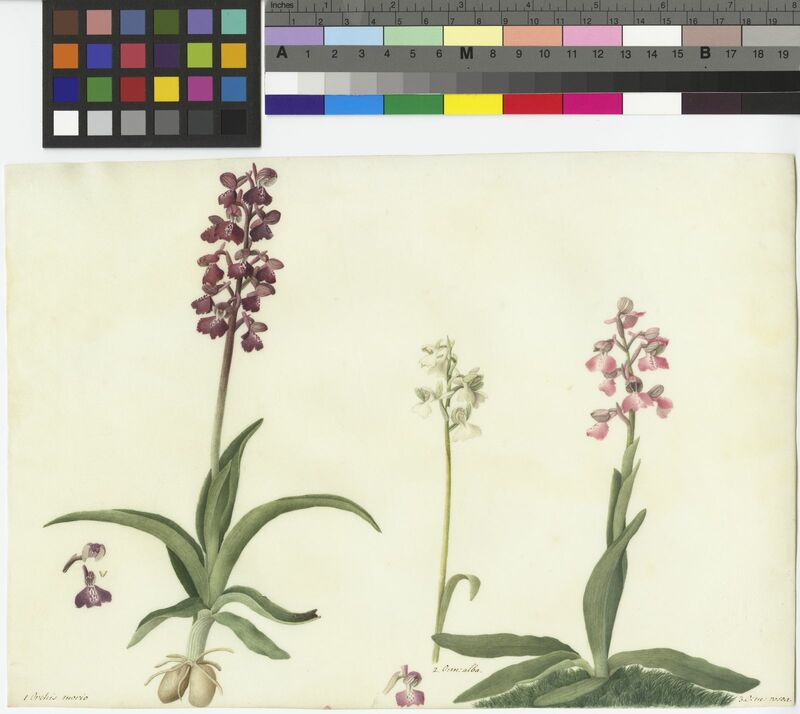 For example, O. mascula often grows under coppiced shrubs in southern England (Summerhayes 1951) where associated species include the orchids Listera cordata R.Br., Platanthera chlorantha and P. bifolia, Orchis purpurea, and Dactylorhiza fuchsii (Lang 1989). Flowering can be enhanced following the periodic cutting of the shrubs when light levels increase but depressed if the shade becomes too intense such that the orchid only persists as a vegetative plant (Summerhayes 1951). ln the hazel glades habitat on Oland, O. mascula frequently co-occurs with a number of plants such as Anthyllis (Fabaceae), Pulsatilla (Ranunculaceae), Fragaria (Rosaceae), Ranunculus (Ranunculaceae), Geum (Rosaceae), and Primula (Primulaceae) and with an even more diverse ground flora in the open alvar meadow (Nilsson 1983a). Orchis purpurea is the most shade-tolerant species of the genus. Its typical habitats in Britain at least are chalk scrub or coppice and beechwoods on the chalk escarpment in southern England (Rose 1948) where it grows in moderately deep shade. 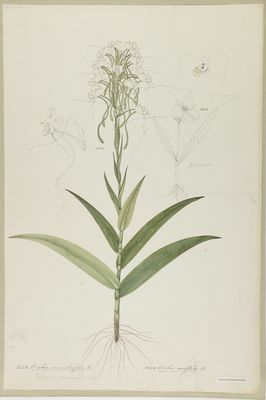 lt is commonly associated with Mercuralis, Helleborus, Daphne, Iris, and Primula, and co-occurs with orchids such as Cephalanthera damasonium (Mill.) 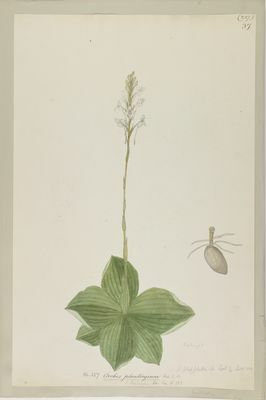 Druce, Listera ovata, Ophrys insectifera, Orchis mascula, Platanthera chlorantha, and Dactylorhiza fuchsii (Summerhayes 1951); it is a component of W12 woodland in the National Vegetation Classification (Rodwell 1992). It grows in filtered sunlight and conditions of high humidity and rarely in open habitats such as chalk downland in Britain, although usually in the shade and shelter of taller shrubs (Summerhayes 1951; Rose 1948). Orchis flowers for several weeks between March and July, the exact flowering period of a population depending on the species, its geographical location, and climatic variations (Davies et al. 1988; Delforge 1995). One of the earliest species to flower in Britain is the early purple orchid, O. mascula, which can start to flower in April , but in Scotland it flowers from late April at sheltered coastal sites and in July on grassy ledges in the uplands (Allan et al. 1993). According to Lang (1989), O. purpurea normally flowers in England from mid-May to early June, but flowering is advanced to the end of April in exceptionally warm years. Orchis species growing in the Mediterranean region tend to bloom earlier than members of the genus in northern Europe. Willems and Ellers (1996) noted the delay in flowering time of O. simia with increased latitude. Populations on Cyprus flowered in April, five to six weeks earlier than comparable populations in the Netherlands, which flowered in late May. 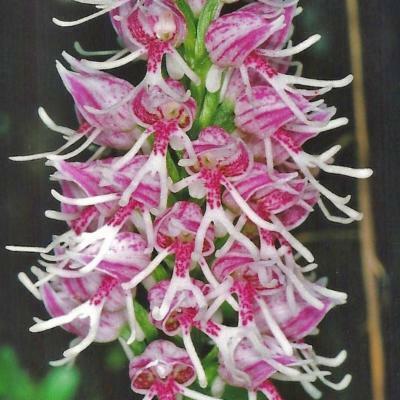 The proportion of Orchis plants in a population that flower varies from year to year. For example, an average of 41.1% of O. anthropophora plants in one study population in England flowered over a 14-year period, but the annual percentage flowering varied widely from 31.1%-72.7% (Wells 1981). Similar annual variations in the frequency of flowering of an O. mascula population in Sweden (Inghe and Tamm 1981; Tamm 1991) were tentatively attributed to fluctuations in climatic variables (temperature and precipitation levels in previous years), but factors controlling flowering in the genus may be more complex than this, perhaps involving, for example, activity of the fungal symbiont (Wells 1981). Periods of flowering in Orchis species are also interspersed with periods of dormancy. ln a population of O. militaris in England, plants remained below ground from one to more than six years before re-emerging (Waite and Farrell 1998), whereas there was a tendency for flowering specimens of O. mascula in Sweden to remain vegetative the following year (lnghe and Tamm 1981; Tamm 1991). 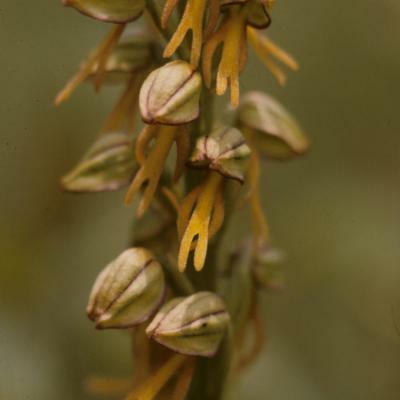 The opportunity for flowering and fruit-set may be relatively infrequent, especially given the suggestion that Orchis have comparatively shorter life spans than other terrestrial orchids. Half-lives of between 4.0 and 7.8 years have been estimated for O. anthropophora (Wells 1981) and of between 2.2 and 7.8 years for O. militaris (Waite and Farrell 1998), although individual plants may live longer. The oldest plants in the O. militaris population studied by Waite and Farrell (1998) were at least 18 years old. Fruit production in Orchis species is normally low, with average fruit-set figures of about 14% for O. italica in Portugal, O. mascula in Sweden and Germany, and O. militaris in Germany and England (Neiland and Wilcock 1998). An even lower fruit production level of 7.8% was recorded in 1992 for O. purpurea in southern England (Neiland 1994); Darwin (1888) commented on the poor fruit-set of this species 100 years earlier from the same area. Seed capsules of O. militaris and other members of the genus take about two months to reach maturity after pollination (Farrell 1985). Germination is inferred to take place in the late summer or autumn, because seedlings of Orchis have been found in the field at this time (Rasmussen 1995). The plants exist as protocorms for over a year before the first tubers are formed in the second or third summer. The tubers develop into short rhizomes with mycotrophic roots in the autumn, and the first leafy shoots emerge in the following spring (Fuchs and Ziegenspeck 1927, cited in Rasmussen 1995). The roots may be heavily infected with different fungal strains. One strain was isolated from a root of O. anthropophora and identified as a Rhizoctonia species (Rasmussen 1995). Symbiotic germination of both O. mascula and O. anthropophora has been achieved with species of Epulorhiza (Rasmussen 1995). Within some Orchis populations, many plants may flower in their first year above ground (Waite and Farrell 1998), but within others an additional two to five years may elapse before the first inflorescence develops (Wells 1981). Plants with aerial shoots, flowering or not, overwinter as a small rosette of green leaves ('winte r-green' species), and the tuber is replaced annually. For example, the new tuber of O. anthropophora begins to develop in January and reaches full size by mid-summer when the orchid is in flower, at which time the old tuber is dying (Wells 1981). Some vegetative propagation may also be achieved if more than one tuber develops per plant, which can explain the occurrence of dense clumps of plants sometimes seen in Orchis populations (Waite and Farrell 1998). 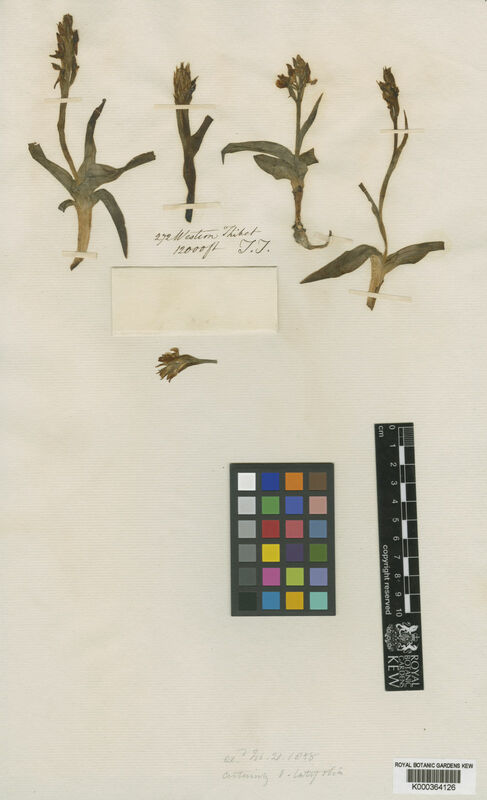 Apart from O. mascula, which is one of the most common orchid species in Europe, and O. anthropophora, which is at least common in the centre and west of its distribution, many members of the genus have localized distributions and are rare. Some are endemic species; others are more widespread but rare in at least parts of their geographic range. Orchis militaris occurs in large populations in Russia, Germany, and Sweden but is a British Red Data Book species and categorized as 'vulnerable' because there are so few populations in southern England (Waite and Farrell 1998). 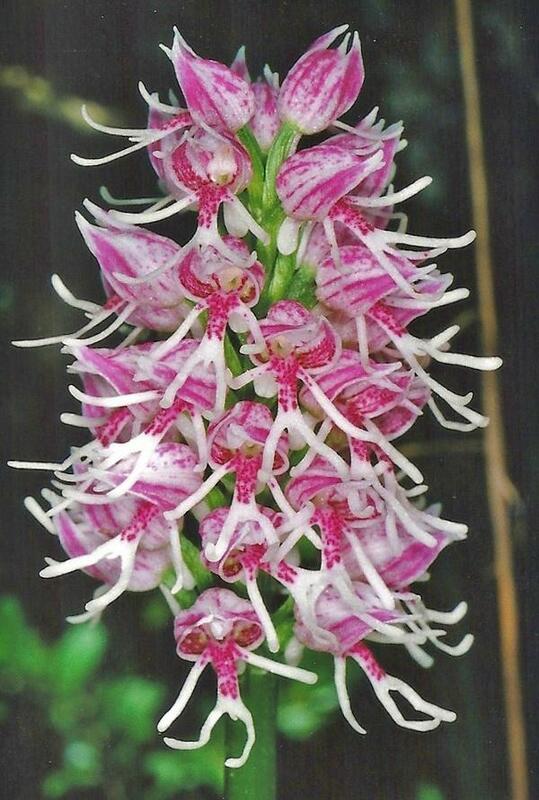 Populations of Orchis may comprise hundreds or thousand of plants, or fewer than 50 individuals. For example, one population of O. anthropophora at Tottenhoe Hills in England varied between 100 and 1000 plants (Wells 1981), but one of the most well-established populations of Orchis militaris was reduced to just 43 plants prior to conservation intervention (Hutchings et a! 1998). Populations of such rare species are often protected but require careful habitat management to ensure their survival. Introduction of management regimes (such as removing invasive competitors and shading trees or increasing seed output by changes in the grazing regime) at populations of some rare Orchis species in England have proved successful in raising the recruitment rate of new plants and therefore increasing population sizes and turnover. Intensive management of one population of O. militaris in Buckinghamshire has altered the age structure of the population such that there has been an increase in younger plants (Hutchings et al. 1998), and management of another O. militaris population has more than doubled the apparent number of plants present at the site. (RN). About 33 species distributed in Europe, particularly the Mediterranean region, temperate Asia, and orth Africa, from the Azores, Madeira, and Canary Islands in the west to Iran and the Caucasus in the east, north as far as Scandinavia. (JW). Small to medium sized herbs. Rootstock tuberous, tubers two (sometimes three), globose, ovoid or ellipsoid, entire, sessile or stipitate. Stem glabrous. Leaves basal, rosulate, spotted or unspotted. lnflorescence cylindrical, sparsely to densely flowered, enclosed in a sheathing spathe-like leaf when emerging; floral bracts usually thin, membranous, never leafy, often coloured. Flowers in various shades of red, purple, pink or yellow, rarely greenish yellow, reddish brown or white, often scented. Dorsal sepal usually erect, free. Petals entire, free, usually porrect. Lateral sepals spreading, erect or connivent with dorsal sepal and petals to form a hood, all glabrous. Labellum decurved, three- or apparently four-lobed, mid-lobe entire or divided into lobules, glabrous or ± papillose above, spurred, rarely spurless, spur filiform or saccate, disc with or without basal calli. Column short, erect; rostellum three-lobed, folded median lobe placed between parallel anther loculi; pollinia two, each with a caudicle attached to separate viscidium or, rarely, connate viscidia enclosed in a single, often bilobed bursicle. Ovary cylindrical, sessile, twisted, glabrous. (JW). The members of several orchids in Europe and the Middle East, particularly of O. mascula and certain other species of Orchis, contain a highly nutritious starch-like substance known as 'bassorin', that can be extracted by drying and subsequent powdering. Collection of tubers for this purpose has long been practised both in Europe and Asia. The product is now generally known as 'salep' or even 'saloop', both English corruptions of the Arabic name sahlah, which was itself thought by Forsskal and others to have been a corruption of the Arabic name tha'lah, a fox. Tackholm & Drar (1969) explained that, although salep was men only to be found in powdered form in me markets of Cairo, it was in former times exhibited there and sold as strings of the dried orchid tubers under such names as khusa al-kalb or khusa ath-tha'lab ('dog's testicles' or 'fox's testicles'), which the rather shrivelled, blackened tubers appeared to resemble. The former of these two common names is mentioned by Ibn al-Baitar (c. 1240). Composed of approximately 27% starch and 48% mucilage, it produces a highly nourishing and easily digested demulcent food when mixed with about 50 parts of water. This beverage (known as sahlah) has since ancient times been given to children; also, when flavoured and mixed with milk, sugar, chopped nuts, etc. and warmed, it provided a drink for adults that was particularly popular during the cold season of the year. There appears to be little solid basis for claims that it was also an aphrodisiac, although these are referred to by Ibn al-Baitar. Salep is also used as an ingredient in the manufacture of ice cream in Turkey and parts of the Middle East. (QW). Orchis × aurunca W.Rossi & Minut. Orchis × beyrichii (Rchb.f.) A.Kern. Orchis × bispurium (G.Keller) H.Kretzschmar, Eccarius & H.Dietr. Orchis × fallax (De Not.) Willk. Orchis × hybrida (Lindl.) Boenn. ex Rchb. Orchis × petterssonii G.Keller ex Pett. Bateman, R.M. (2009). Evolutionary classification of European orchids: the crucial importance of maximising explicit evidence and minimising authoritarian speculation Journal Europäischer Orchideen 41: 243-318. Pridgeon, A.M., Cribb, P.J., Chase, M.C. & Rasmussen, F.N. (2001). Orchidoideae (Part 1) Genera Orchidacearum 2: 1-416. Oxford University Press, New York, Oxford.